But at the same time, scientists and engineers were furiously filing secret patent applications that described many of the parts in exquisite detail. Those patents sat not behind the fences at Los Alamos, but in a vault at the U.S. Patent Office. It’s a great story I heard in the car this morning about the odd, really quaint way the intellectual property world used to work, before the term intellectual property existed but on the very dawn of the modern age. Of course today the patents would be owned by consortia of “non profit” research universities and their derivatives trading arms. 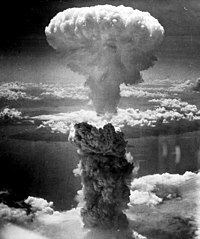 The names FAT MAN, LITTLE BOY and ENOLA GAY would be registered trademarks whose exploitation would be managed by the marketing and “IP management” spinoffs of the Atomic Energy Administration. And of course Stalin would have known about the whole thing in advance because they would have been filed as ITU‘s anyway.